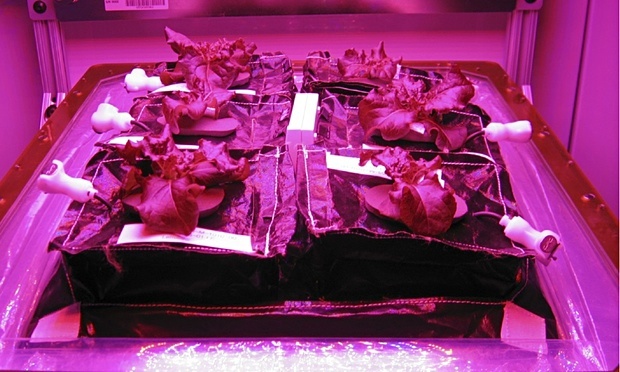 Astronauts aboard the ISS have been growing romaine lettuce under LED lights. (Image credit: NASA). If you want a fresh salad you might take a trip to the shop, or maybe to your allotment. But what if you’re orbiting the Earth at more than 7.5 kilometres per second? That’s the problem faced by astronauts on the International Space Station (ISS), who have no refrigeration and are used to only having fresh foods immediately after a cargo craft has docked. 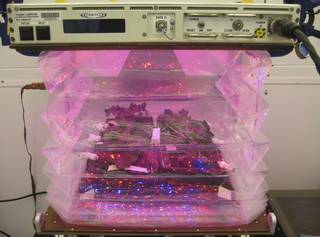 Until now, that is; for the last month or so the crew of the ISS have been growing their own lettuce. That isn’t as easy as it sounds in an artificial environment where everything floats because there’s no gravity, so the plants are grown in a unit known as a VEGGIE. The soil and lettuce seeds are contained in a special kind of grow bag called a ‘plant pillow’, and had to be carefully positioned so that they would grow in the right direction. 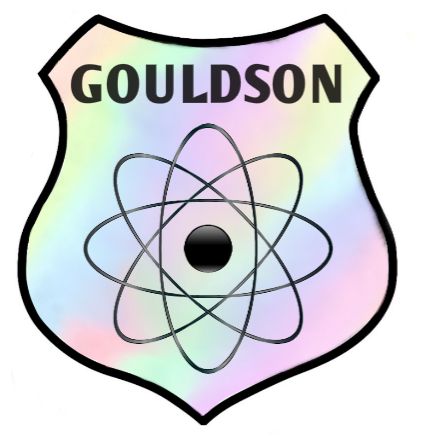 If a seed is planted upside down on Earth it will automatically grow upwards anyway, but in space where there’s no gravity it could just as easily grow downwards! Watering the plants is also difficult, as without gravity water droplets just float in the air and could damage valuable equipment. Instead the VEGGIE unit contains a reservoir of water in the base, covered with a permeable fabric, while the base of the plant pillow is also covered with this fabric and allows the water to gradually seep through. Special wicks then guide the water to each plant. 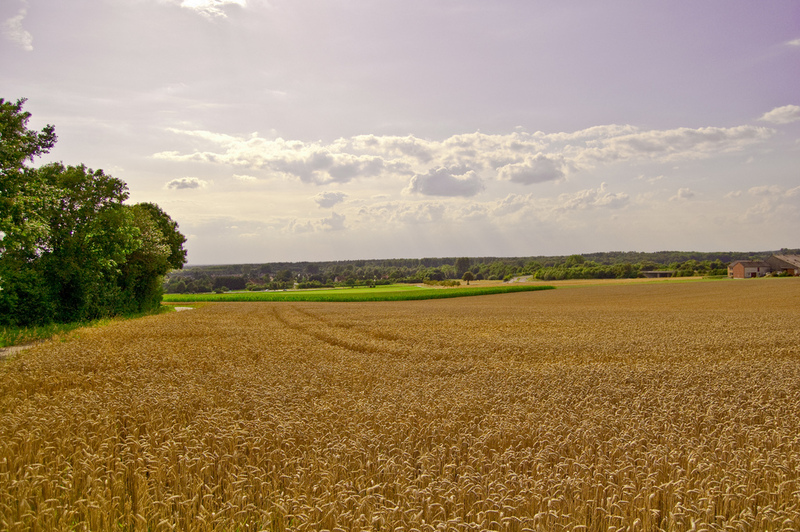 That’s the seeds, soil and water taken care of – but what about light? As you can see from the pictures, the plants are grown in purple-coloured light. This is provided by banks of LEDs, 95% of which are red and 5% blue. This provides the best combination of lightwaves for the plants to photosynthesise (use light energy to turn carbon dioxide into sugars) and grow. The special VEGGIE unit was thoroughly tested before being sent to the ISS. (Image credit: NASA/Bryan Onate). The first batch of space lettuce was sent back to NASA for testing, to ensure that the plants weren’t contaminated with anything or contained unexpected pathogens. 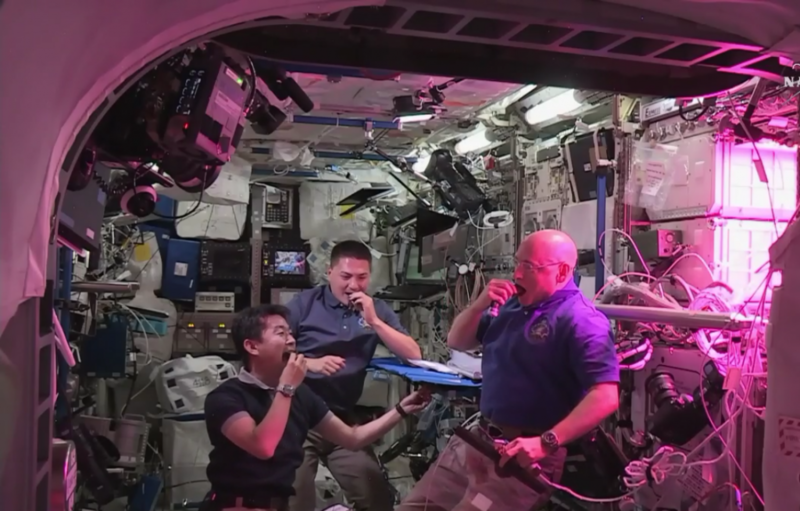 This time around the astronauts were allowed to eat the crop they’ve so carefully grown. 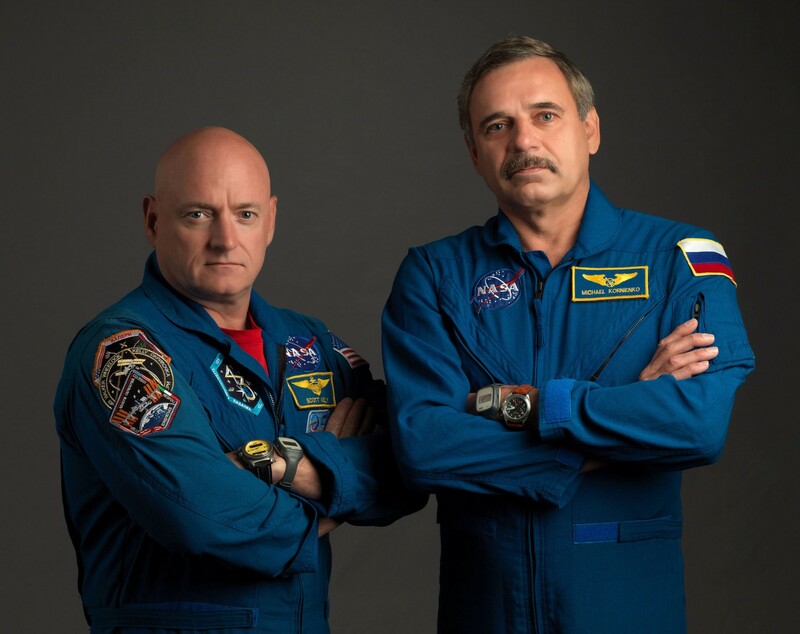 Scott Kelly, Kimiya Yui and Kjell Lindgren said they enjoyed the fresh leaves, and were keeping some aside for their Russian colleagues to try later on. The first time space-grown food has been eaten. 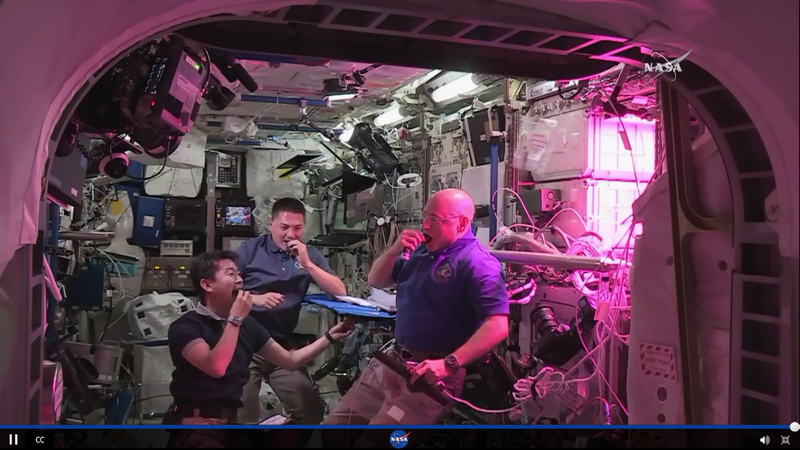 From left to right you can see Kimiya Yui, Kjell Lindgren and Scott Kelly (Image credit: NASA TV).